This LP has 74 parts. 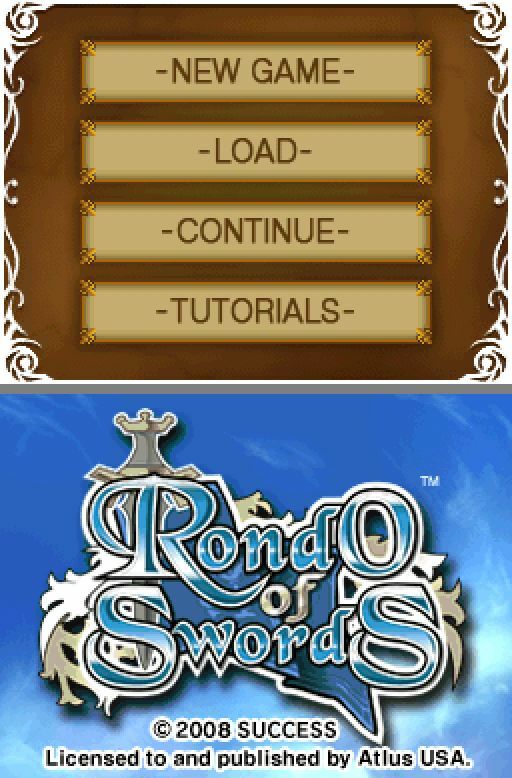 Let's Play Rondo of Swords! Rondo of Swords was released in Japan as "Rondo of Deception" on August 7, 2007 by Success Corporation. You might know them for the Izuna: Legend of the Unemployed Ninja or The Dark Spire DS dungeon crawler games, all three of which Atlus localized and published in North America. Back home, Success is also known for the Cotton series of shmup games. You might notice that dungeon crawlers and shmups are two of the more merciless genres. Dark Spire, in particular, is known for its spitefulness. This is because Success Corporation hates you. Tell me about Rondo of Swords. Rondo of Swords is a rather unconventional tactical RPG. While the game takes place on a turn-based grid, you attack by moving through enemies. You can attack as many enemies as you pass through. But wait, you may ask. If that's the case, then how you can make defensive lines? If the enemy can just walk right through your units, can't they just go right for your more fragile ones? Welcome to Rondo of Swords. - None of the between-map systems are explained. - Recruiting more units can lock you out of additional between-maps content, including items necessary for character promotions. - Many of your units are fragile. - You aren't allowed to see how much damage you'll do or take before attacks. Make your best guess! - You aren't allowed to see dodge or counter chances (though both are rare). - You aren't allowed to see enemy attack or magic ranges either. Sure, all enemy bowmen might have the same base range... But then they start getting +range skills. - You don't see enemy skill levels, which could let you judge the above. - The game doesn't have permadeath, but losing a unit on a map will result in that unit having halved stats on the next map -- in a game with subtraction-based attack and defense. Despite all of this, Rondo of Swords is perfectly possible to complete. I quite like it, even. You just have to know what you're doing. 1) No spoilers. The game's plot isn't exceptional, but it does some good things here and there. Don't spoil future events, even in tags. 2) I'm not going to open voting for characters, and I'm not going to show off every character. I'll talk about what they can do and their skill list, but Rondo of Swords isn't forgiving enough for goon roster selection. The New Game+ run will be an exception, because it's New Game+. There will be voting at certain points in the game, and I'll say when. 3) This is a fresh run. New Game+ exists, but I haven't even unlocked it on the game I'm using. 4) I'll post updates every other day (except in the case of small interval updates or corrections, which will be posted between main updates). 5) Some scenes are voice-acted, but it's relatively rare outside of combat. There isn't enough action in cutscenes to warrant video, but I'll post tindeck links to particularly important bits of voice acting. This will otherwise be a screenshot LP. These are stage directions -- things like "Camera pans down to street." -- or my comments.